Chuckit! Fetch Medley Balls Medium is a variety set that includes three of our favorite balls: The Whistler, Max Glow, and Rebounce Ball. The Whistler twitters and whistles when passing through the air. The Max Glow glows in the dark to allow the game to keep going even when the sun goes down. The Rebounce is an environmental-friendly ball that utilizes recycled natural rubber to create this bright colored bouncy ball. Chuckit! 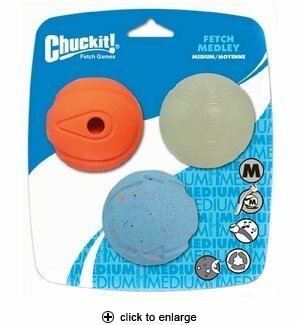 Fetch Medley Balls are compatible for use with Chuckit! Classic, Pocket, Junior, 18M, 25M, and Ultra Ball Launchers. Ideal for older dogs or smaller spaces.